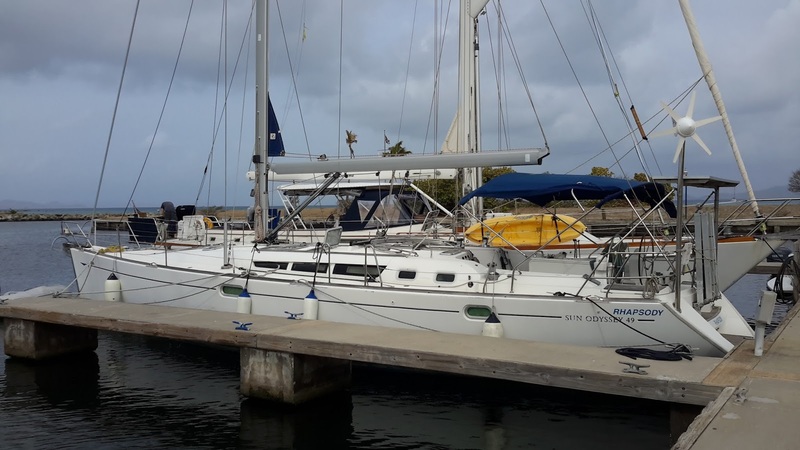 Actually she is on the murky green of the Virgin Gorda Yacht Harbor, but she is in the water. We have had several days trying rather unsuccessfully to avoid Mr. Murphy. Starting with our house batteries, they were working when we got to the boat, and we were so pleased because the wind generator and the solar panels had kept them charged. We left our refrigerator on overnight, came back to Rhapsody in the morning and there was no power. We spent 24 hours on Sunday afraid that we might have to of replace all the batteries. $$$ :(. However, on Monday we got an electrician to trace the problem, and it was just a fuse. We were quite relieved and watched very carefully as the electrician traced the problem and at least next time we will have a better idea how to begin searching for a solution ourselves and we will have a spare fuse. We had an appointment to have the boat launched at 10:30 AM. In December when Bob was having Rhapsody hauled, the same boatyard also gave him a 10:30 timeslot, and he was not hauled out until 2:30, thus we figured we had some time in the morning to prepare. We were at Rhapsody at 7AM. At 7:20 the yard men asked if we were ready to launch! Not wanting to wait any longer we agreed. It was fascinating watching the big crane apparatus drive over Rhapsody, have her strapped in, driven to the water and lowered in. A day spent readying Rhapsody, motoring to the dock, pumping up Melody, our dinghy, and getting her in the water, washing off all of the Saharan dust that blows across the ocean and lands in the Virgin Islands, and on Rhapsody, and generally preparing to go sailing. Pictures may be limited in the future. It took over an hour to upload that picture! Nice boat! So interesting about the desert dust. We look forward to tracking your adventures! The desert dust is less interesting when you have to clean out of every crevice!